And hey I'm not the boss! PS: I left QQ off this and feel horrible but also not really, but we may want to keep them apart? Christmas plans this year y/n? (1/2) Hey boss lady, I need tomorrow off. I know I promised to work all weekend, but something's come up. I'll make it up next week or something. Got a few things to work out. Dude, sorry if I came off all judgey or something. You know I think you're cool right? [1/2] I have very vegetarian tacos and fresh churros and fruit and ice cream. [2/2] Help me devour all this deliciousness. Doug has managed to get into the NYPD computer system (apparently, it was in the nature of a slice of baked goods) and has provided me with copies of the "lost" ccTV footage of the cell into which the Black Rook was placed. It may not surprise you (it certainly didn't surprise me) that the policeman on duty were not backward in encouraging his cellmates to, to use their words "kill the mutie". He has also tracked down the location of the clothing of the Black Rook's cellmates in the rather arcane evidence storage system, and some further information on the presence of quite a number of members of New York's finest who believe that the only good mutant is a dead mutant and who aren't afraid to commit that to email (amongst their closest friends, anyway). I'll need to borrow your acting talents in the morning (the daylight morning), Adrienne. Julian, I am sending a courier to you with a number of things Doug unearthed. Once Adrienne has Read the evidence, there should be enough to provide to Shaw's lawyers and allow them to do those things that lawyers do. The Black King has requested my urgent presence at the Club. He seemed agitated. If I haven't returned by midnight, call... the police? UNESCO? For a pizza? Whatever seems appropriate. [1/4] So I'm in a store. There's a creepy, motion-sensor hand that grabs you when you try to take candy from the bowl it's attached to. [2/4] Which means we totally have to plan a Halloween thing. [4/4] Kid friendly until like midnight and then the kids go away and we break out the hard liquor? I am asking for at least two weeks off. I am driving cross-country back to California with Alex so we can empty out our apartment. (it hasn't seen another person since the beginning of the year and I am dreading of what we will find). My contacts say Brotherhood have cleared the area but where they are, I am not sure. Most likely they are on the move. If you like me to check in on our other safehouses for the railroad let me know. I can make some stops for that. Thanks for the email the other day - it helps to know there's some cool adults here. 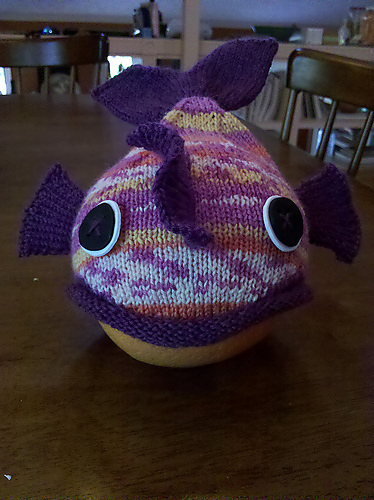 A birthday card and this knitted minnow hat.